Yup. 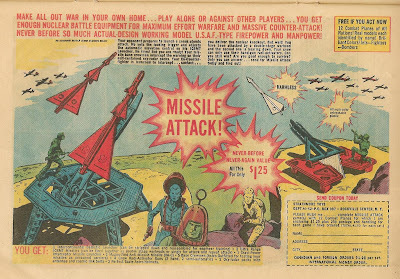 Nothing says fun like a toy that allows you to simulate nuclear war in you own bedroom! 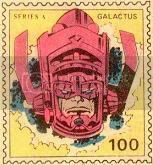 I especially dig the little helmets and antennae the men are wearing... that'll protect 'em for sure. I wonder if they're made from the same material as those fallout-proof school desks kids used to have to duck and cover under? Considering the very real threat of the Cuban Missile Crisis just a few years before, I'm astonished an ad even made it to print. Then again, this is the same country that had people lining up to buy silver coins because they were minted from silver in the basement of the World Trade Center. Also, I don't think people were as squeamish about stuff back then. Fewer alarmist parents groups. That sort of thing.